Here is Kevin Borseth, women's basketball coach of the Michigan Wolverines. Maybe he should have been considered for the UM football coaching position, or maybe he should have gave the pregame speech before App. State. Forget about Russell Crowe! Do you think Lloyd Carr would still have his job? This just in to The College Football Guys. It has come to our attention that no University of Tennessee football players were arrested during the mighty Vols run as number one in college basketball. Well done Rocky Top! Well done! Here is something from a blog that has way more time on their hands to research then I do. I know that may seem hard to believe! In today's world of college football, everyone is looking for that edge. Seems some schools have found a way to get ahead without breaking NCAA rules. EDSBS.com keeps tabs on the arrests of all the NCAA schools football teams. There is lots of press lately about Tennessee, Alabama, and FSU, however lets hear it for Missouri, Illinois and Oregon State. They are really learning how to run with the big dawgs! No wonder their programs have improved so much! At least they have weight rooms in prison! Spring Ball is almost here for most of us! Texas had to get the jump, starting on the 22nd of Feb. But, we all know "everything is better in Texas!" I have to admit it. I need help! After attending our co-host's bachelor party this weekend in Vegas, I have questions. Questions I was hoping our sophisticated readers could answer. As everyone knows a group of male, 20-30 somethings in Vegas always gravitate towards the finer things in life, booze, women, gambling, food, hedonism and debauchery. You know the like. Of all these things, the one thing that puzzles this college football guy the most is the "gentleman's" club scene. The bewilderment is in the separation of reality and myth. 1. The scantily clad woman on the billboard out front of the club has NEVER been an employee of the club and there isn't anyone inside that looks like her. 2. The gentleman's club contains the only restroom, in America, that has more colon to choose from then the Estee Lauder counter at Macy's. 3. The parents of these poor ladies should be shot for naming their children after sweets and mountain ranges. Things a child should never have to live with. 4. Good news for those getting in the plastic surgery business, it seems there are plenty of impressionable women willing to pay for a bad job. 5. The five dollar steak dinner was purchased pre-cooked at Costco and reheated for your enjoyment. 6. NEVER enter a club that allows one to "BYOB!" The following is what I am most confused about, are any of the stories the women tell true? I know the age old line, "I am doing this to get through college" only is true about .5% of the time, but what about these I heard this weekend? "I don't tell a whole lot of people here this, but I graduated from Florida State with a education degree. I don't teach anymore cause I was always sick. I am a vegetarian, teach yoga and want to open a holistic health clinic." "I moved here from San Fran a year and a half ago and was a cocktail waitress and thought I would try this out. I miss home, but I am having a great time!" "I live in St. George (an 1:40 from Vegas) and drive in for a week, work, hang out and then go back home for a week. I love the outdoors and enjoy hiking somewhere and getting high!" Was I duped? Are any of these stories real or are they silicon? One story that is real, former "dancer" Diablo Cody just won an academy award this weekend. I wonder what she used to tell her "clientele?" Big Red Sports/Imports. Proud Sponsors of Texas Football! OU fans rejoice! Your 2005 season is vacant no longer! The NCAA has agreed to give back your 8 wins from the 2005 season. Included is a needed victory over the UO Ducks in the 2005 Holiday Bowl. This comes nearly two years after the PAC 10 officials took away an OU victory in Eugene in 2006. Finally justice is served for those Boomer Sooners. Justice? What would a mascot that glorifies the cheaters of the Oklahoma land rush know about justice? Maybe turn about is fair play? Well now we know OU's 2005 season is complete, what of everyone else involved in the payday scandal? Big Red Sports/Imports still alive and well. However it seems the old owner has flown the coup. Expelled QB Rhett Bomar is a QB at Sam Houston State, however you can tell from this clip he still dreams of Norman. This after a 39-3 loss to Oklahoma State. Bomar's partner in crime, offensive lineman JD Quinn seems to be doing great at the University of Montana. It's alright it is only your first DUI. Seems Oklahoma got the better end of this deal. "Giving the Business" - A History Lesson. In the Maryland/NCSU game this year the ref made an interesting call that most had never heard of, Personal Foul for "giving him the business." Seems there is precedence for this call. The second video is evidence from a NY Jets/Buffalo Bills game of the Jim Kelly era. Depth! Learn it. Get it. Build it." This is a direct quote from our Southern co-host Ethan Bush, from Baton Rouge, with regards to Oregon's lack of QB depth after Dennis Dixon went down. 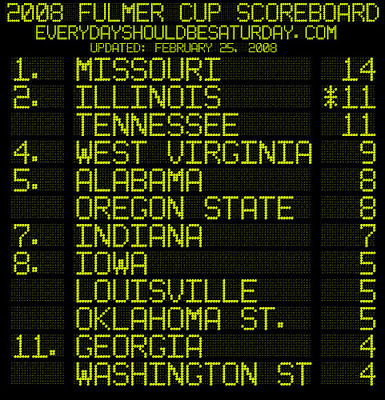 (Bowl Picks for The College Football Guys 12/10/07 podcast - in case you want to look it up). Hope your defending champion LSU Tigers learn the meaning of the word FAST my friend! LSU QB Ryan Perrilloux suspended indefinitely. The College Football Guys thoughts and prayers are with you Northern Illinois. 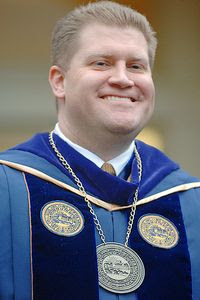 Mike Garrison, President of West Virginia University. Well we are a week out from National Letter of Intent Day and still no decision from Terrelle Pryor, and does anyone care? Seems those of us that are not Penn State/Michigan/Ohio State fans have moved on with our lives. So much for building the suspense and making the public wait. I guess his advisor, Charlie Batch, didn't take the Roger Clemens saga into consideration. Check back later this week as we unveil the true identity of this man! LSU, watch out! Is it your turn? The defending BCS Champion LSU Tigers have scheduled the three time defending FCS Champions Appalachian State to begin next season. If App. State pulls the upset, again, will that make App. State the outright National Champions? LSU don't forget, Appalachain is Hot, Hot, Hot! In case you didn't see the story. Just one GREAT example of how crazy college recruiting has become! Well today’s the day! 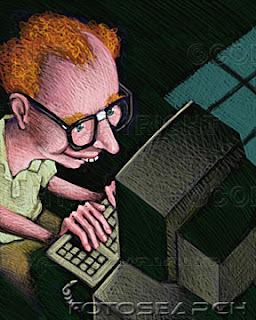 The day that bloggers and message boarders from across the country, call in sick (who am I kidding – they don’t have jobs), lock themselves in their basements, in front of their computers, and pine and drool over 17 and 18 year old boys! Is Michael Jackson giving away free memberships to his fan club today? No, it is in fact “National Letter of Intent Day.” A day high schoolers hold 65 year old alumni hostage. Today at least one Division I coach’s administrative assistant will lose their job because they failed to replace the toner in the fax machine. This day marks the culmination of one of the most important jobs a coaching staff has and one that may ultimately decide their fate. It is true that in order to compete on a national level you must have the best talent, but for every former number one overall (Vince Young, QB/Texas; Adrian Peterson, RB/OU; Percy Harvin, WR/Florida), your team must also find and develop the three star talent (Mike Hart, RB/Michigan; Matt Ryan, QB/Boston College; Jacob Hester, RB/LSU) and the two star (James Laurinaitis, LB/Ohio State). Today marks just ONE piece of the puzzle to build a great program. The others are heart, determination, teamwork, and great coaching! So if a recruiting service has blessed you with a top 25 ranking enjoy it while it lasts and pray that, four years from now, your team looks more like this year's USC, LSU, Ohio State, Georgia and less like Florida State, Miami, Purdue, Washington. Here is Rivals’ ranking of the class of 2004, last year’s red shirt juniors and true seniors. I wish I would have thought of this my senior year in high school! A little humor (and true story) to wet your signing day appetite. This kid is either incredibly stupid, or loves a great joke! LSU, Enjoy the Championship while you have it! See you next year! Gators, Bulldogs, and your closest SEC Friends! 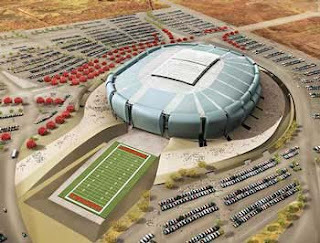 Curse of The University of Phoenix Stadium? What did we learn boys and girls? When it comes to big games in the beautiful "Bell Cactus of the Desert" take the dogs and the points, heck who needs the points? Sit back and watch a great upset!